THE 2019 HOME & GARDEN TOUR WILL TAKE PLACE SATURDAY JULY 13th. Tickets will be available soon. On Saturday and Sunday, July 8 & 9, 2017, from 10 am – 4 pm, Palmer Woods opened seven of neighborhood’s most extraordinary gardens — including the Frank Lloyd Wright Garden and the B & D Garden Design Garden — and a five fabulous homes from the Mid-Century era. This was a self-guided walking tour with docents stationed at each home and garden to provide insights on history, architecture, design, gardening and more! Detroit’s Palmer Woods neighborhood, founded more than a century ago, is well known for its grand mansions, especially of Tudor influence, which were constructed in the early 20th century. At that time it was popular for people with wealth to be conspicuous about display of their assets, particularly with their homes. Our Palmer Woods Home & Garden Tour will feature homes of this era, showing an array of styles and designs which were “contemporary” at the time. When you tour the homes, which were built and first occupied by notable people such as Weight Watcher’s Florine Mark, you will undoubtedly be impressed with the design elements which were introduced during that period. For photos of the 2015 tour by Terrance A. Keith, click here and for photos of the 2015 tour by Barbara Barefield, click here. A magical garden sits behind a French Eclectic style residence built in 1928 by acclaimed architect Wallace Frost, an associate of Albert Kahn. The garden was originally designed by Jas. D. Burford for the first owner, Maurice Goldenberg, who was a civil engineer and worked with Kahn’s brother Julius Kahn. Current homeowners Linda and Chris Cardine have unearthed the original garden designs to inspire their updated garden. Photo ©Barbara Barefield. 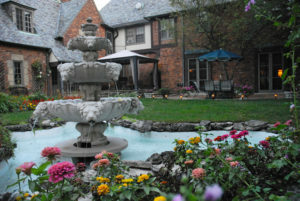 A modern interpretation of a formal English garden with pools filled with lilies and koi, as well as semi-formal beds with all perennial plants (mostly natives) and walkways of crushed limestone (to eliminate the need for grass), sits behind a 1928 Tudor Revival/English Cottage style home designed by architect Lewis C. Miller in 1928. Designed in 2011 by Detroit landscape architect Jeff Klein, the garden owned by Jodee and Roy Raines offers a beautiful contrast to the other gardens on the tour. Photo ©Barbara Barefield. Please sign up on the form at the bottom of this page to receive notice of our events, or revisit our website later this year for more information. 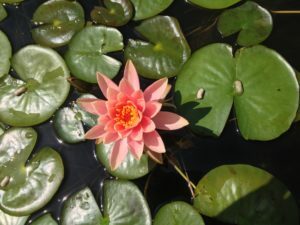 To read about the 2014 tour and see a photo book of the gardens by Barbara Barefield click here.